Throughout the month of February 2014, there were some faint aurora displays in the northern sky, usually consisting of a continuous pale-green glow with an occasional needle-like searchlight near the northern horizon. I had already captured these faint glows in some of my Ring of Brodgar and Hammars Hill wind farm images, but was optimistic that it was only a matter of time before we witnessed a more colourful and dramatic display. My ambition was to capture an illuminated Ring of Brodgar stone circle under a spectacular aurora. On a clear, moonless night in February, I decided to visit the Ring of Brodgar to try my luck at capturing the Milky Way above the standing stones, which I planned to illuminate. If I were to see the aurora, that would be a bonus; however, I was not expecting one, nor was one forecast. But as I stepped outside early in the evening to check the sky conditions before heading out, I noticed the whole northern sky shimmering with green and red shafts of light that beamed down to the ground. Excitedly I called my wife and daughter, and together we witnessed a mesmerising prolonged display that covered at least half the sky. Green was the predominant colour, but this was interspersed with occasional red shafts of light. The light pattern, which varied in intensity, mimicked a curtain being waved back and forth. My wife urged me to get my camera, but initially I resisted, wanting to soak up the atmospheric sky and enjoy this unique display. During this time, red and green searchlights were everywhere in the sky, even to the south. Eventually I went inside to get my camera, hoping that the display would not lose any of its intensity. On returning with camera and tripod, I hurriedly set up and tried a few shots of 15 secs at the back of the house. I managed to record the colours quite well, and then had the idea to move round to the front of the house to attempt to capture the aurora above the house while at the same time attempting to use a torch to light the front. 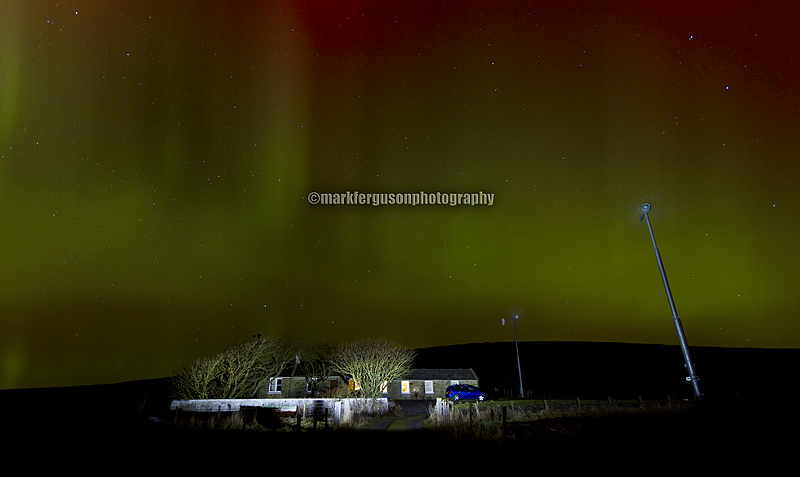 As the aurora was varying in intensity, I experimented with different exposure times - anything from 20 to 40 secs. The camera was sat on a tripod, and I used continuous exposures locked on a cable release. This allowed me to walk up to the front of the house and use my torch. It was impossible to know how the exposure would appear on camera, but I was confident that at least one exposure would be satisfactory. The camera took several consecutive images before the colours began to wane. Reviewing my images on the back of my Canon 7D, I was delighted to see that the mystical 'needle-like' shafts of green and red could clearly be seen above my clearly illuminated home. I then remembered that my initial plan for the evening had been to photograph the Ring of Brodgar standing stones under the Milky Way. However, the aurora display meant that I now had a great opportunity to capture my coveted image, and so I expectantly cycled off towards Brodgar, with the display continuing overhead. On arrival 30 minutes later, the aurora had lost some of its colour and intensity. It was, however, still visible, so I decided it was still worth trying to light the stones below the aurora. As before, I set my camera on a tripod and used a cable remote to continuously shoot 25-second exposures, while at the same time using my torch to light the standing stones. The aurora continued to wane and lose its vibrant reds and greens, but I still managed to capture a unique image that shows a moment in time. See image below.